- You’ll most likely trigger this quest on your way to Diamond City for the first time, as it’s found on the road leading south from Concord. Watch for signs of a red-roofed building on your left as you wander south along the road. - Upon approach you’ll hear yelling, and you’ll see a pair of NPCs, Wolfgang and Simone, standing outside the Diner. Talk to Wolfgang to get the skinny on the situation - the owner’s son owes him money - then prepare to make some choices. Agree to help Wolfgang. You’ll get into a gun fight with Trudy and her son Patrick. 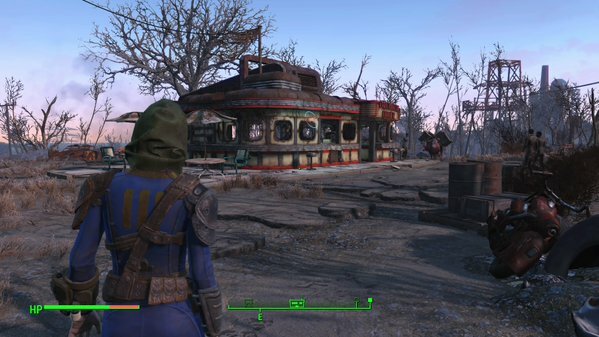 Once they’re dead Wolfgang will take over the Diner and use it to vend his chems, if you ever need any. You’ll get 100 Bottlecaps for helping. Agree to help Trudy. The gun fight is reversed, and you’ll have to kill Wolfgang and Simone. Trudy keeps her Diner and uses it as a spot to vend. You’ll again get 100 Bottlecaps. You can also convince her, with high enough Charisma, to pay you 200 Bottlecaps instead. - One last thing: I’ve noticed that Trashcan Carla likes to linger here during the gunfight. Try not to shoot her accidentally, yeah? She won't like that. I killed wolfgang to early and played a while. Now I can't talk to him (he is dead) and the quest will no longer be able to be completed. Does anyone have a gauge of how high your Charisma needs to be for the peaceful resolution to this quest?